It’s been such a busy week that I was beginning to think the only chance I’d have to introduce you to my next Oliver + S fabric collection (like I promised on Twitter the other day) would be by taking photos with my iPad, fabrics arranged on the floor of the airport. Really, it’s been that kind of week. Thankfully, a flight delay and the scanner at home came to my rescue. I think you’ll be able to see the prints much better this way than in images shot with an iPad at JFK airport. Usually, we wait until our fabric collections are starting to ship before we introduce them to you, but this time I thought it would be fun to let you see them in advance. I really hate keeping secrets! 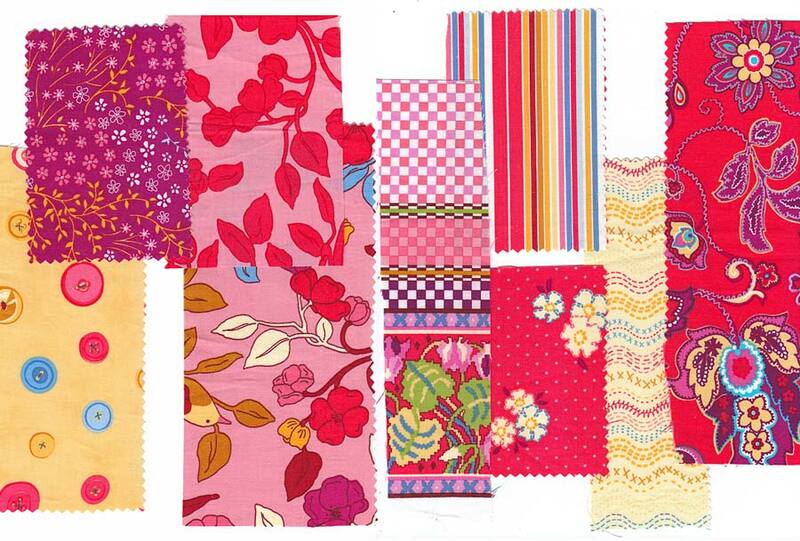 These fabrics won’t actually be available until July, but I know you can be patient, right? 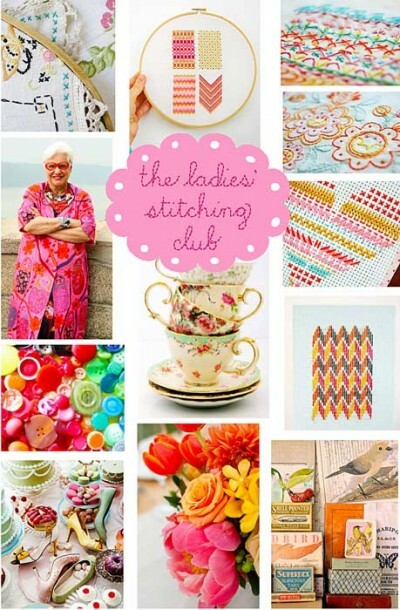 Let me introduce you to The Ladies’ Stitching Club. I’ve told you before that I always start with an idea or concept for a collection, and then as I’m developing the prints I start telling myself little stories about them. This collection started out as a sewing- and stitching-inspired group of prints. I knew I wanted to feature details like hand embroidery in my designs, and I had already drawn a lot of the motifs. But it wasn’t until I actually started working on the prints that the story started to develop. The Ladies’ Stitching Club is the story of a young woman who dreamed one night of a gorgeous blouse. It was covered with embroidery and wonderful details that she had never seen before. When she awoke the next day, she couldn’t stop thinking about the blouse. After several days of pondering this wonderful creation, she decided that she’d better learn to sew so that she could make it for herself. After asking around for a while, she was referred (I’m sure it was her local quilt shop that did the referring, although that’s not part of the story) to an elderly woman who had worked for many years as a seamstress. The two women hit it off immediately, despite the different in their ages, and they struck up a friendship that went well beyond their sewing lessons. Soon, other women heard about the lessons and wanted to join. Before they realized what was happening, a strong, supportive community of like-minded women had developed, and their shared interests went far beyond sewing and embroidery. They threw garden parties and tea parties for no particular reason, visited museums together, and spent their time volunteering in the community. The result was a network of women who supported each other through hardships, who celebrated their victories, and who became lifelong friends. All with a sense of humor and a freedom to be themselves, no matter how eccentric and usual that might be. Isn’t that a nice story? I think that’s what happens when women find a common cause. We bond together and form powerful connections. We’re a good bunch, women. 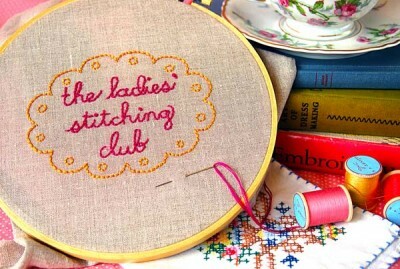 That’s what I was thinking about as I worked on the prints that became Ladies’ Stitching Club. Ladies’ Stitching Club came together in three colorways: Tea Party (pink, plum and gold), Garden Party (red, gold and blue), and Solarium (plum, blue and green). The prints, as you can see, have lots of stitching and garden motifs, and maybe a few drawing room and solarium motifs, too. Moda is taking wholesale orders for this collection right now, so I’d love it if you would help me get the word out about it by talking with your local quilt shops. It’s orders that are placed this month that determine how widely available the collection will be when it begins arriving in stores next summer. 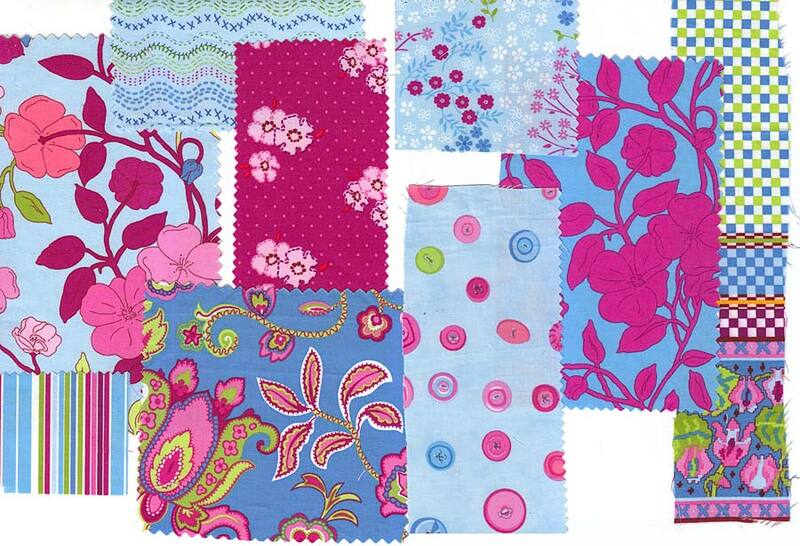 We’ll be showing you lots of samples made with the fabrics when the spring patterns launch later this month. And in the very near future, I’ll show you how the quilt that I designed for this group worked out. I’m so pleased with it. My wonderfully resourceful Moda colleagues Lissa and Lisa found a way to strip piece my design, and I was amazed by how clever it is! I think you will be too. No, I can’t be patient! 🙂 These are wonderful and I adore the backstory! Will there be embroidery designs to go with this collection too? I love it. LOVE this new collection…thanks for showing us early! PRETTY!!! I’m excited! Love some of those floral patterns especially. Collection looks lovely – so happy for you, and the collection looks happy. Love the story and the inspiration pictures and then seeing them come together in the beautiful colourful fabric is enchanting! Great work! I love the new fabric. I will make sure to request that my LQS orders some, I would love to pick some up locally when I need it. So excited!!! The colors are beautiful. Are these patterns meant for children? Because I think I would like to wear them. Also, if you can find the time, I wouldn’t mind reading Ladies’ Stitching Club, the novel. So glad these won’t be out until July, when I graduate, because otherwise I’d definitely cheat on schoolwork to sew with them. Already have plans for several of these, and so excited for the border print! I can’t pick a favorite. I honestly can’t. I better start saving my pennies, this could be dangerous. I really love the stripes in all three colorways. Great color combos too. Oh Liesl!! These are FABULOUS! Love them, such beautiful colors and designs. Congrats on another fantastic line! So pretty! My favourites are the small florals and the stripe in the Garden Party colorway. I think the stripe would make wonderful quilt binding. I do love the colours. The solarium colour scheme is my favourite. It will take us a bit longer to get these here in OZ, but I will keep my eye out. I LOVE this line. I love all the thought and creativity that you put into your designs. I can’t wait to see the new patterns. I think everything you touch turns to gold! Keep it comin’!!! Lovely! Can’t wait to see these in person! Is this print collection on different substrates? Some almost look like they might be on something a little lighter than regular quilting-weight; perhaps a lawn or voile? Wow, these are absolutely beautiful! Wow wow wow! I Love this collection! Congratulations to you Liesl! I will definitely have an excuse to use some of these prints that is certain! Can’t wait! You have outdone yourself, Liesl. Every print is beautiful and the inspiration story made me smile. I can’t wait to play with this beautiful fabric! I know what to ask hubby for when my birthday rolls around in July!! Gorgeous Liesl. Oh, it’s so lovely!! 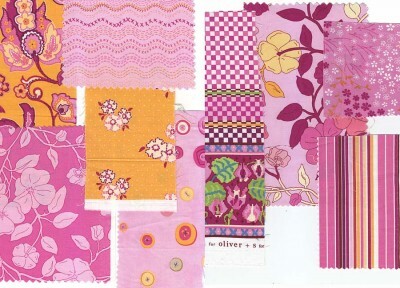 I would love to make a quilt for my daughter with this! It really speaks of women sitting and sharing their love and knowledge with each other. The fabrics are absolutely stunning. I have a quilt in mind to use them- with embroidery. Love the background story. Where do we get the fabrics? Fabrics will be available from all the usual places starting in late-July. I’m salivating! These are just so so so…… well you know what I’m trying to say! Can we still get these prints in charm packs or are they all done???? You might still be able to find them with some clever searching, but it’s been quite a few years since this collection came out.